Extracurricular Activities : Dance and Music. Taking part in local competitions in writing, arts, etc. Naur, a beautiful village of Distt. 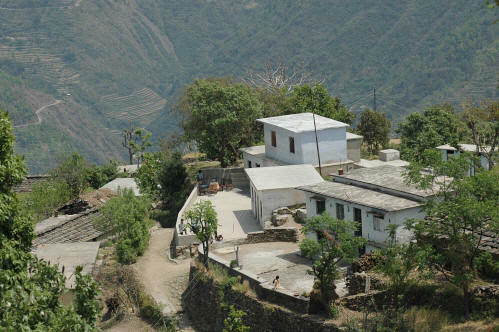 Tehri Garhwal, is situated 3 km from the Rishikesh - Gangotri Road between Agrakhal and Jajal. In the village, there is temple dedicated to Narasimha. One finds unlimited natural beauty, wonderful scenery, a huge variety of Himalayan flowers and Divine atmosphere to enjoy. People are full of praise for Swami Omkarananda for His kind blessings in the form of this wonderful School. This Junior High School is a very well managed School. The Management Committee as well as Teaching Staff is fully committed towards quality education for the children which is obvious with the past records the children of this School set in the District and local level competitions. Left: Parents are well informed and very interested to get good education for their children. They appreciate very much to have an Omkarananda School in the village and they appreciate also that representatives from the Omkarananda Educational Society come to check the School and discuss with the teachers and parents the problems and questions.